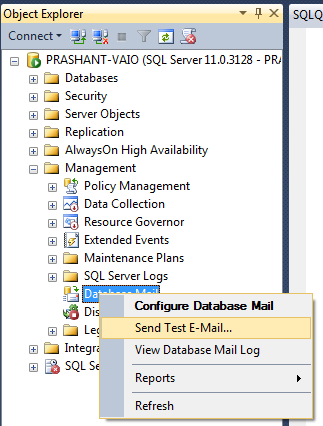 In our previous post we have discussed about how to configure SQL Server Database Mail. 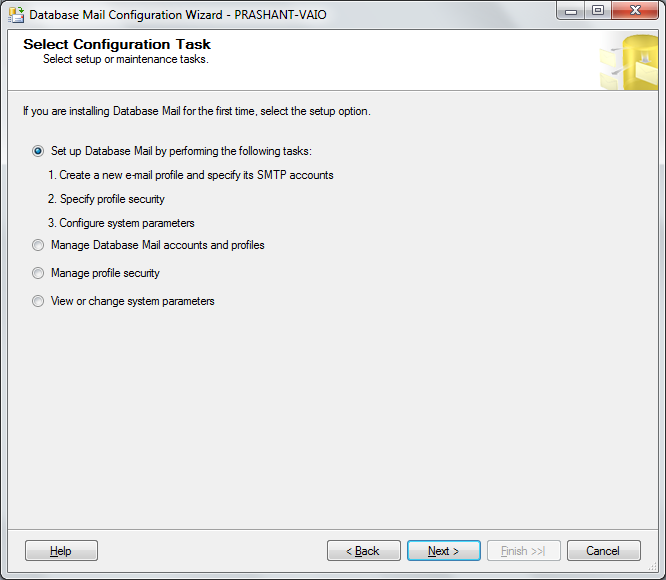 Once the database mail (dbmail) is configured that dbmail profile can be used in TSQL queries or stored procedures to send e-mails to specified recipients. 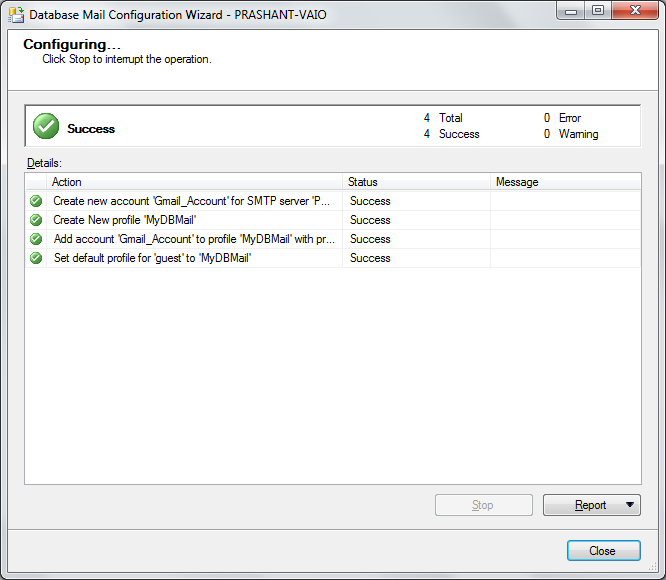 When you successfully issue a sp_send_dbmail command the mail will be queued in the Database Mail queue and returns a mailid value as message. sp_send_dbmail stored procedure is available in the msdb database. This is an autogenerated mail from SQL Database Server 01. In case of any concerns please contact sqldb01.mailadmin@organisation.com . Hope this post helps you with a new learning. 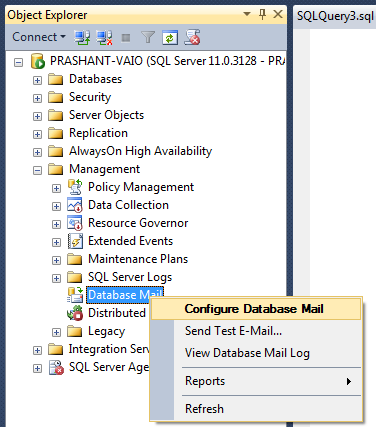 In this post we will see how to configuring SQL Server Database Mail for sending mails using Gmail Account or Live Mail account. 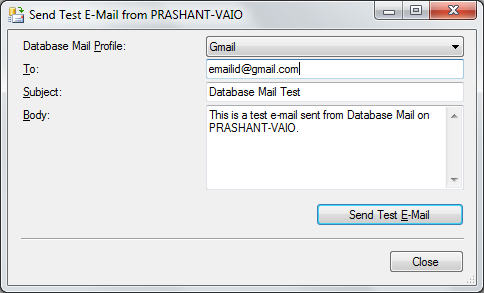 By using Database Mail a database application can send e-mail messages to users with SQL query results and also include additional attachment files in either plain text or html format. 5. 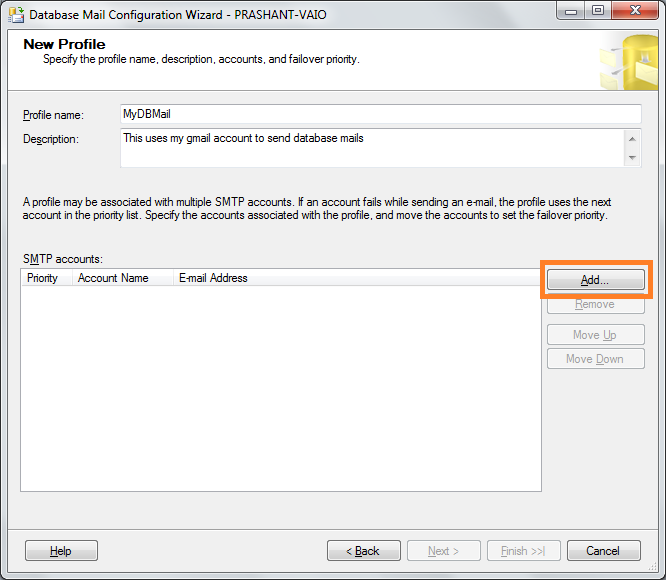 In New Database Mail Account window provide details of the email account which you want to use to send emails. 6. 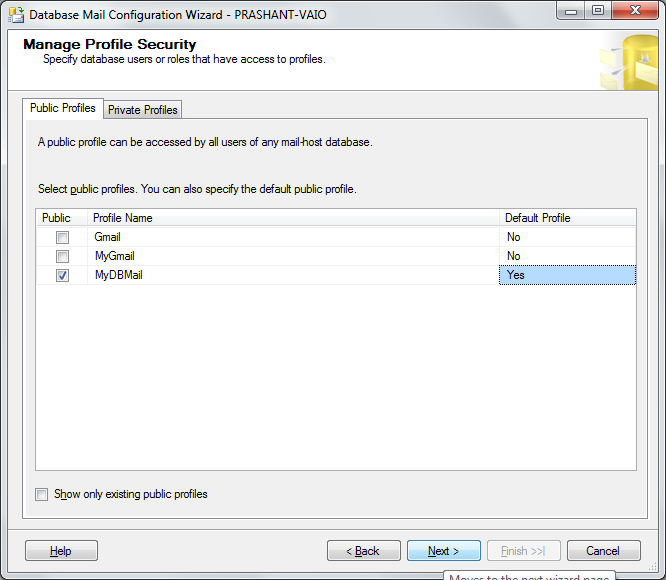 In Manage Profile Security you can select the profile that you wants to make as public profile which can be accessible by all users of any mail host database. 7. 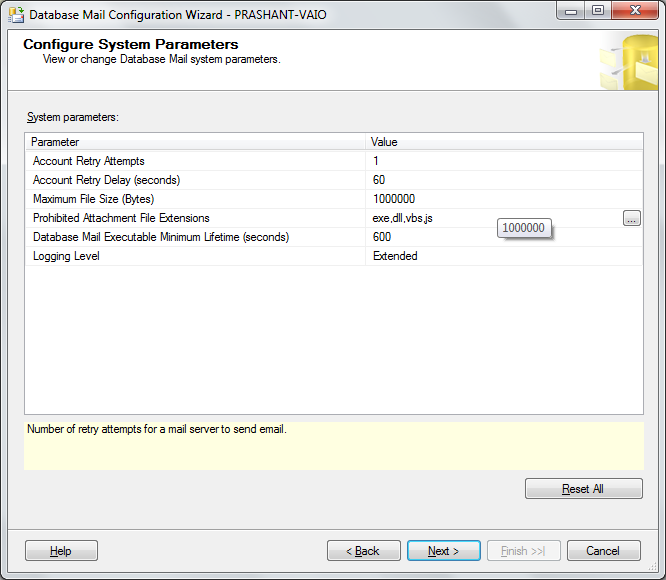 Configure System Parameters here you can modify the default parameter settings as per your need e.g restricting file types not to allow in mail attachment, max size of file…etc. 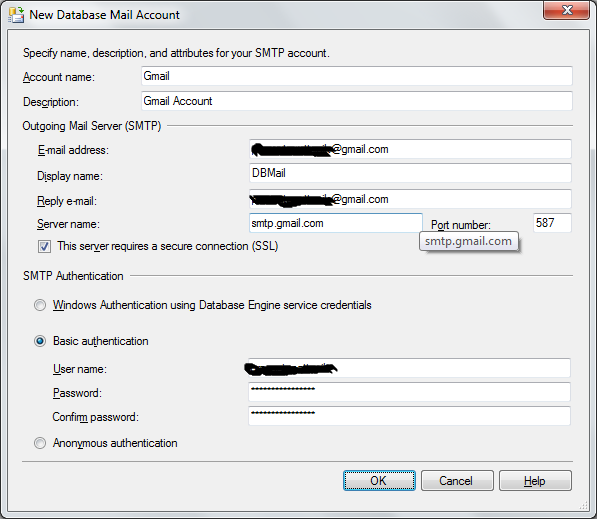 Upon on finish it will configure the database mail settings. 9. Click Close and you are done with the database mail configuration. 10. Once this is done try to send a test mail to check the email. Here the email will be queued then will be processed by database mail. If you find this post helpful feel free to comment and share. Database developers commonly ask for date formats while comparing date columns, showing dates in different format and etc using SQL query. In this post we will see a consolidated list for various date formats that are available and we use in our queries. Refer msdn for more details on date formats. One of my DBA friends asked me to if we can track the size growth of a production database happened on daily basis. However looking into the system tables, there is no option to get database growth over a period of time. So to achieve this report we need to have the database size information collected daily or what ever time frame we need the growth report. In this port we will go step by step for this task. Now we need to populate the table over a period of time, so we need to create a SQL Agent job to execute this stored procedure and schedule this job to run everyday. Now we have the information over the period of time and we can run our below query to make a report out of this data. While working on a ssis project recently I was trying to build the solution however it was failing again and again without showing any error in Error List !!! and when I checked the Output List it was saying the below message (refer Fig-1). 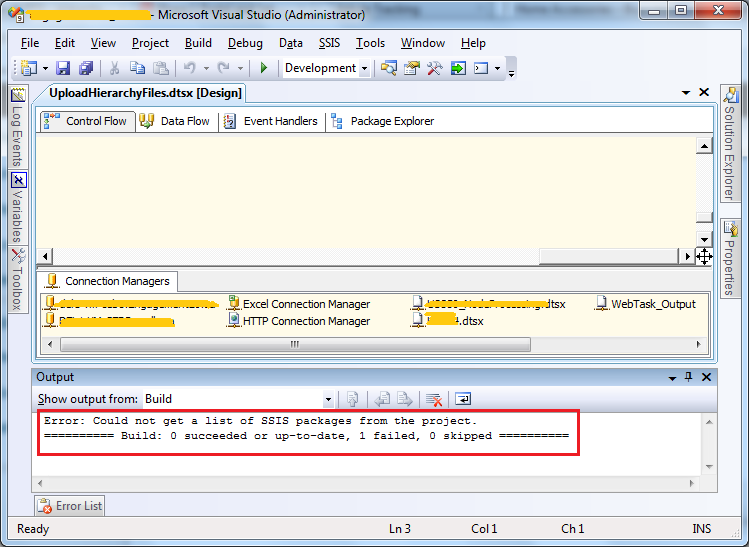 Error: Could not get a list of SSIS packages from the project. This message says there is some missing objects in the project (.dtproj), as CreateDeploymentUtility property was set to True for this project the ssis was not able to show the actual error message. So set the CreateDeploymentUtility to False and build the project again to get the actual error. In my case there was a package added in the project however because of some source control issues the .dtsx file was not available in the project directory. Now that you got the error to fix; go ahead and fix the issue then set CreateDeploymentUtility property to True and build the project successfully. 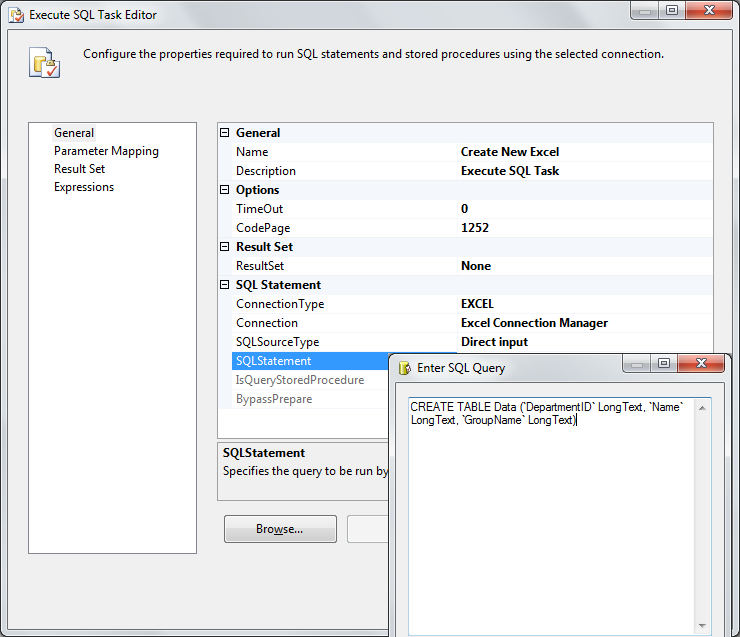 Recently I got a requirement to export error data to a newly created excel file every time the SSIS package runs. The challenge here was to create new excel file with time stamp every time the package ran and export data to that newly created file. In this post will demonstrate this step by step. Create a template file to export the data. You need this template file to set up the package for the first time. Once the setup is done you can delete the template. 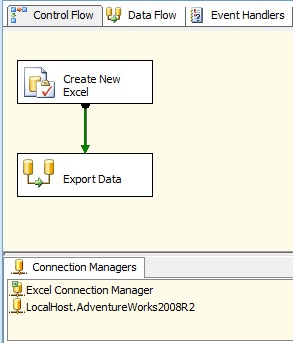 Add Excel Connection Manager pointing to the template excel file created before. 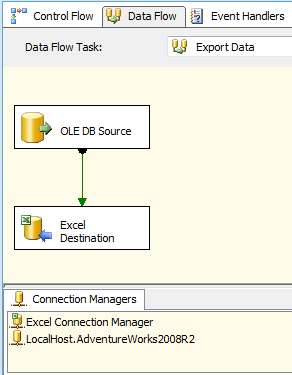 Now setup a Data Flow Task to export the data. Add an Excel Destination to the package. In the excel destination editor select Table or View as Data Access Mode, select the name of excel sheet and do the required mapping. Set ValidateExternalMetadata property to False. "S:\\ETL Lab\\CreateNewExcel\\ExportData_"+REPLACE((DT_STR, 20, 1252)(DT_DBTIMESTAMP)@[System::StartTime], ":", "")+".xls"
and the package is ready to run. You can download the sample package here. When one of our projects deployed to production application was throwing a strange error and while debugging it is found that one of the stored procedure getting failed because of collation conflict issue. The reason behind this error is the stored procedure used a temp table to join a table on string column. Temp tables are created on TempDB, so if you don’t specify collation for a string columns they inherit the collation of TempDB. If the collation of user database doesn’t match with the collation of TempDB and you are comparing and/or joining on string columns, it may cause this collation conflict issue. There are many ways to resolve this issue. However the best way as per me is to change to specify the collation of the string column of temp table to database default, so that it will inherit the collation of .user database. Today while developing a piece of logic in our development, my colleague said that I know there is a procedure which has same kind of logic and that may help us building the logic quickly. But the question was how to find that procedure !!! Then the idea came up was if we can find the list of procedures that are dependable on Table1 & Table2 ? …and that inspired me to write this post. We spend some time researching system tables and here is the findings to find list of tables used in a procedure. Let me know if you have any better idea for this.